Bed wetting is one of the worst disorders you may have. While it is common in kids, sometimes this problem persists in teenagers or adults as well. The shame and disgrace attached with this disorder, in many cases, affects the sufferer as well as his family. This is because society thinks that a person who wets the bed is not subjected to good parenting or has lived an abnormal life. The bedwetting disorder is called enuresis and is common among children. Parents usually neglect enuresis in kids up to the age of 5. Most parents think enuresis is mandatory in childhood. However, they get alarmed if the habit continues beyond the age of five. It is important to know that enuresis is not a normal case. To prevent the problem in kids, some kind of medication is needed at an early stage. There are a number of psychological treatments and therapies offered to bedwetting patients to stop enuresis. The treatments usually stop the disorder. However, in rare cases, bedwetting can become a lifetime disorder and some alternate measures have to be taken. A bedwetting alarm is one alternative that can be used to prevent this nocturnal issue. Enuresis alarms have two parts: a small sensor and an alarm. The sensor is connected to the kid’s undergarments and the alarm attached to the trouser or pajamas. As soon as the sensor starts getting wet, the alarm starts ringing. For kids with hearing impairment, vibrating bedwetting alarms systems can be used. You can get bedwetting sensor alarms from medical shops in your area. There are also various child health organizations that sell some of the best bedwetting alarm systems in the market. You can get one alarm from them. However, keep in mind that the systems are not recommended by doctors because they can have some adverse effects on the child. At first, your child may find the bedwetting alarm annoying. However, the sensor will eventually help him understand when it’s time to go to the washroom. Still, some kids may find it a task to leave their bed every time the alarm rings. You may find the kids putting off the alarm deliberately. Such kids usually have prolonged episodes of enuresis. Parents should understand these behaviors and come up with ways of dealing with them. For example, you can offer a reward or gift if the child wakes up and goes to the bathroom when the alarm rings. This will make the child develop a habit of going to the bathroom. Over time, he will not need any reward but will go to the bathroom habitually. How Long Should You Use a Bedwetting Alarm System? The time span of using an enuresis alarm is usually four weeks. Within these four weeks, you will know whether the therapy or treatment is effective on the kid. If using the alarm makes your child reduce bed wetting, this means the treatment is working. If there is no improvement beyond four weeks, then the therapy will not be working. You will know your child is improving if he does not wet the bed for two consecutive days. However, if the improvement is very minimal after three months, go for an alternative treatment. After 30 years of practical application and thorough research, Therapee came up with several advanced bedwetting alarms as well as a web-based software that enhances the sleeping experience of people who have natural medical problems. Here are the qualities of Therapee bedwetting solution. The device has two parts, a sensor pad, and a bedwetting alarm. However, the alarm is linked to an online software program that is used to guide patients through dry nights and to help them sleep comfortably without any disturbances. The STOPEE pad is made using the latest technology to ensure it does not give false alarms due to seat or humidity. Once the pad senses the first drop of urine, it will respond by ringing out loudly hence making you aware accordingly. Therapee sensor pads are made of PVC materials and hence are comfortable. The material makes the bedwetting alarm reliable and long lasting compared to other enuresis alarms. Moreover, the material doesn’t have any side effects and hence will not irritate your skin. When you order the device, you will be provided with an activation code which gives you access to a visualization chart that will show the users progress. When you log in to the software for the first time, there is a welcome video that will guide you on how to use Therapee to stop bedwetting at home). Wetstop3 is approved by the FDA and has 5 variable alarms that can be set according to your choice. The vibration capability of the alarm is an added advantage if your kid isn’t woken up by a loud sound. The pack of WetStop3 includes a bedwetting book CD and motivational stickers for a reward system. There is also a multi-language instruction booklet to help parents keep track and use the alarm effectively. 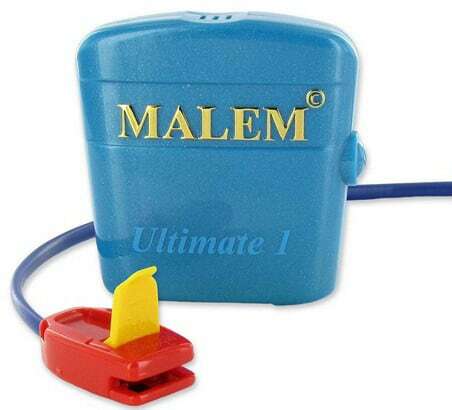 The Ultimate by Malem is one of the top-rated bedwetting alarms. The system has various features that will wake your baby in deep sleep. These features include vibration, sound, and light. The bedwetting alarm is lightweight and easy to clip. The system uses sensor technology that makes it vibrate and sound an alarm to wake up the kid as soon as moisture is sensed in the underpants. The Malem bedwetting system pack comes with video instructions which will allow you to use it effectively from the first day. The clip is safe and has a firm grip, which ensures the sensor stays at its place, even if the child sleeps in an awkward position. he enuresis alarm has a plastic embossed moisture-sense pad for the bed, which is positioned beneath the child. When the strips of the pads sensor detect any moisture, the alarm goes off. The pad needs to be positioned either inside a pillowcase or under a bed sheet. The mat is attached to a battery-powered alarm by a 7-ft cord. Don’t worry about the length of the cord; it will not really disturb your child while he/she is sleeping. The 21″ x by 15.5″ bed-mat is easy to clean and dries fast. The alarm comes with a range of sound options to wake up your child. You can select from 8 different sounds depending on what you or your child would like. If you don’t like the default tone set by manufacturers of kids bedwetting alarms, buy the Malem Ultimate Bedside Alarm with Pad. Even better, if you do not like the 8 alarm tones, you can record a custom one and use it. The bedwetting alarm has flashing lights and a volume control. When the alarm goes off, you the lights start flashing. Thus, you can easily find the gadget and switch it off even when there is no light in the room. Read our Malem Ultimate review. The Rodger Wireless Bedwetting system is a comfortable alarm that comes with a battery or plugin receiver. The alarm package consists of a transmitter, receiver and 2 unisex briefs. The transmitter is advanced yet not very heavy, enabling it to sense the moisture. The transmitter can work from even 75 feet. The volume of the device is adjustable. Rodger has been making most successful bed wetting alarms since 2003. The Rodger Wireless Bedwetting Alarm is a total solution for dryness to the bedwetting dilemmas of your kids. Easy to use, your kids will also find this easy to wear due to the fact that the underwear does fit like regular underwear. The difference is that there are threads which are invisibly sewn in the underpants which connect to 2 studs you press by the waist band. When it is time to sleep, your son or daughter attaches a tiny transmitter to the underpants press studs. The receiving alarm then plugs into an outlet which is convenient in the bedroom of your child. You also have the option of using 2 double-A batteries with the Rodger Wireless Bedwetting Alarm System. The receiving alarms have a volume control which is variable and permits you to make an adjustment on the volumes controls to what feels comfortable. When the alarm sounds, it tends to sound continuously until the reset button on the receivers front is pressed to turn it off. This guarantees that your child gets up when the alarm sounds rather than falling back to sleep after turning off the alarm. Read our Rodger Wireless System review. nlike some bedwetting alarms, DryEasy comes with sound and vibration indicators as well as volume control settings. Though there are no light indicators, the unit still works effectively as it will wake up your child as soon as it senses drops of urine. You can activate vibration and sound either separately or at once. The alarm’s open cover design makes it easy to maintain as it is easy to clean. Although there are bedwetting units that offer a three-combination alert (sound, vibration and light), the DryEasy model offers has a unique preset combination of vibration and sound. With the three settings on the device, you can choose sound and vibration, sound only and vibration only. This alarm unit has two major components: the sensor clip and a sound monitor. The sensor clip is to be attached to the child’s underwear so that it can easily detect the first drops urine. The monitor will be linked to the clip through a soft wire that is clipped on the user’s shirt. Once the device detects the initial drops of urine, it vibrates, triggering an alert. This is what will wake up the user. Just make sure that you have pinned the monitor near the user’s ear. The Toggle Smart sensor in the bedwetting alarm has a newly designed detector that can fix any problems with the alarm sensors. Moreover, the toggle clamp technique where the sensor is firmly attached has been improved and will easily send an alert. The unit has six different alert sounds so that your child will not become used to a particular sound and ends up ignoring the alarm. The alerts can be set to switch randomly among the six sound recording or trigger just one of the sounds. No one is comfortable with bedwetting even if they’re 10 years old. Most kids view bedwetting as a chronic condition that does not go away despite the treatment and aids available. If your child is going through this difficult situation, Chummie Premium may be the best way to resolve your problem. Chummie is a complete bedwetting treatment regime that is convenient and affordable. It is also an award-winning alarm system that is doctor recommended, encompassing all features necessary for the immediate detection of urine drops and discretion. Kids love Chummie’s friendly appearance while parents appreciate how convenient its alarm system is. Chummie has an amazing design and is smaller than a debit card. The alarm is tamper-proof and is controlled by a lightweight microprocessor that is easy to program, even by a 5 year old kid. Unlike some competing bedwetting alarms in the market, Chummie Premium has a patented armband. This is an alternative and comfortable method of attaching the wireless bedwetting alarm to clipping. Another feature that makes Chummie the best bedwetting alarm is that it’s hypoallergenic. This means it does not irritate the ski. Below are additional features that will help you decide if you want to purchase the alarm. One of the best bedwetting alarms available on the market is from Anzacare. The company is known for introducing a wireless device to the market – The Anzacare DRI Sleeper Eclipse. The machine is ISO 13485:2003 certified and is known as one of the most effective and best functioning in treating kids with urinary incontinence. The Anzacare DRI Eclipse is an anti-bedwetting device that is comfortable, easy to use and highly efficient. The device has flexible Urosensors that provide a big surface area making it easy to detect urine early on. Since the Urosensors are comfortable, your kids can wear the wireless bedwetting alarm underneath their underwear. The device was designed with durability and quality in mind there are no metals or other corrosive elements used that might depreciate after being in contact with urine. Moreover, since there are no metals on the wireless bedwetting alarm, you do not have to worry about corrosion issues. The Dri Sleeper Eclipse is a wireless alarm. Therefore, it is easy for children to use since there are no wires to be connected. The device can be placed underneath the user’s underwear next to the skin. After this, it should be switched on so that it can sound an alarm once it senses wetness. The bedwetting alarm is available in different colors, which make it more appealing to kids. Moreover, its tones are loud enough to wake the child and/or parent from sleep. Similar to baby alarms, the wireless signal can be transmitted to different monitors. These are the best alarm bedwetting systems in the market. They are good solutions BUT in some cases are not suitable. If you feel your child cannot deal with enuresis mentally, it is best to stop using the alarms. If the child is sharing a room with siblings, they may find the alarm sounds disturbing. This may make the bedwetting child embarrassed with the problem. There are many psychological and emotional implications that bedwetting alarms can have on kids. Thus, you should only use them if you are sure they will not mentally affect the kids.